This will be the week. In the next few days, the Port Authority, with the complicit endorsement of the Queensland State Government, will break the most fundamental crime of democracy. They will remove demolish the remaining structure and remove the 100 year old building from where it's rested for over a century. They will have totally disregarded the public and the community of cairns for the sake of one more highrise. The campaign has been long and arduous. There have been hundreds involved in various ways over the last 5 years. 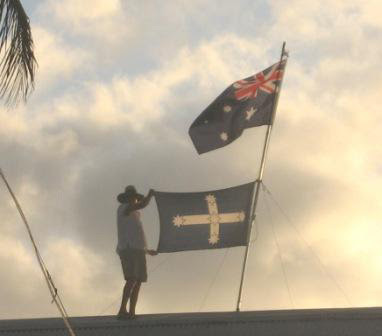 Many were members of the 110 year old Cairns Yacht Club. Some were Commodores. Some were not members, just concerned citizens, angry and ashamed that their Council and State Government would not stand up for them, and commit the ultimate act of betrayal. Over the last few weeks, a series on citizens have engaged in acts of defiance to demonstrate their disgust at elected officials in allowing this heritage destruction to occur. And it goes right to the top. Federal Environment and Heritage Minister Peter Garret also did nothing but comply with the Queensland Premier. What the Labor Party has become is something truly shocking. No one would have believed that they would disengage from the people like the way they have in destroying and removing the historic Cairns Yacht Club building from the Cairns waterfront. However, they told the truth at least once. It was and is all about money. In a letter on Friday, State Minister Mickel, who is a director of the Cairns Port Authority, said they've lost around a $1M in rent fr4om that site, because the old club house was there. So to 71-year-old Terry Spackman, who scaled the roof and keep the demolition team off the site for over 6 hours, we bow to you. You are what politicians should be doing. Standing up and putting your principals on the line. When was the last time you heard a politician do this? Then there was Sharon Powell, of the "Anyone but Kevin Bryne for Mayor" T-shirt fame. Sharon also defied authorities and was arrested attempting to scale the boundary fence two weeks ago, while 35 police were guarding the property. People who wear their convictions on their sleeve, deserve the admiration from us all, no matter where you stand on this issue. They are prepared to stand up, and be counted and tell their story. Desley Boyle, the State Member for Cairns, will be hiding away in Brisbane this week. She should be ashamed to return to our city later in the week, after this building is removed. 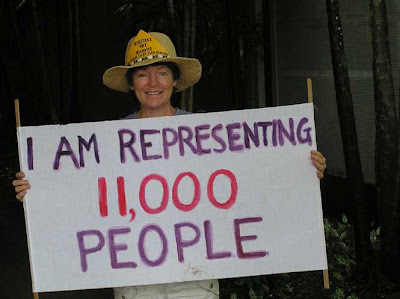 Terry and Sharon, Cairns needs a lot more people like you folk to expose and hold public officials to account.